Quick Notes: Here is a snapshot about what is happening on the gems and jewelry scene now. Spinel in various colors is hot, Myanmar is an important source for spinel and the U.S trade embargo did not cover this gorgeous gemstone. Expect to find inclusions in most of these gems or, pay a hefty premium if you prefer an eye clean gem. Africa is still making an impact on ruby gemstone supply, these gems cover a wide range of prices. Sapphires have established a loyal market for themselves, colors other than blue are increasingly drawing interest. An interesting development related to buyers of high end jewelry relates to increased gemstone knowledge. With a few fine jewelry providers like Kaisilver, making it their responsibility buyers are showing a keener interest in rare gems and natural gems with interesting characteristics. The idea that all gems should be perfect and eye clean has given way to a more mature thought, that some degree of inclusions and blemishes in natural gems are a happening of nature. While gold jewelry is finding buyers, the demand for quality sterling silver jewels is growing robustly for the past few years. Our firm belief is that the modern day jewelry savvy buyer is building jewelry collections that include a range of metals, gems and styles. This attitude is working well for everyone involved, jewelers are able to develop merchandise for various price points, most gemstones have started moving well in the market and buyers, are being given a dazzling variety of gemstones and jewelry to choose from. A gorgeous sapphire and diamond ring, an interesting variation from the regular blue sapphire ring - the RG224PS ring is decked with custom cut pink sapphire gemstones. Order the ring with blue, white, pink, green or yellow sapphire gems. Awesome design and expert craftsmanship make this ring perfect for casual or formal wear. The same quality standards for the gold or 925 silver sapphire ring mean that, you can make a choice based on your budget. Wish for something very colorful, mix different sapphire colors in the ring ... more. The four century old claddagh ring has impressed thousands of discerning buyers across the globe. 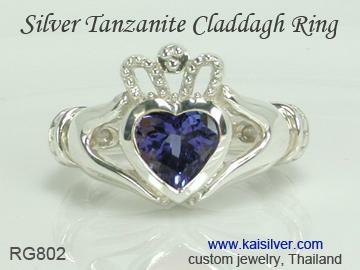 It is now widely accepted that the Kaisilver cladagh ring is the best rendition of the legendary jewel. 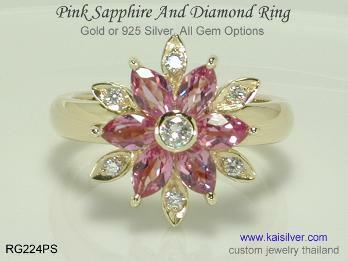 You can choose gold or 925 sterling silver and the gemstone of your choice. And don't forget that your gem selection need not be limited to what you see on our website. Skilled artisans work on each jewel and our gem experts carefully handpick every gem, the idea is to ensure that you get good value for what you pay ... more. For men who appreciate quality jewelry and gems that are exotic and rare. A spessartite gold or 925 silver ring for men. Hefty metal weight, sturdy construction and design features that help enhance the durability of the ring. 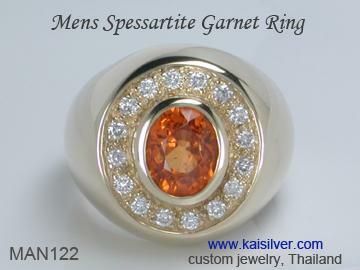 Custom made with gems of your choice, the image shows the spessartite men's ring with diamonds around the center gem but, you can pick white sapphires, rubies or any gem of your choice. Available in 14k and 18k white, yellow or pink gold and 925 sterling silver ... more. Almonds need no introduction and most of us would have eaten them. Nutrition experts now say that the skin on the almonds which was once thought to be a great source of fiber, actually inhibits the perfect release of nutrients from the nuts. It is therefore recommended that the almonds be soaked and then peeled, the soaking process makes the peeling task easier. Soaked almonds also become a bit softer and this makes them easier to chew and digest. 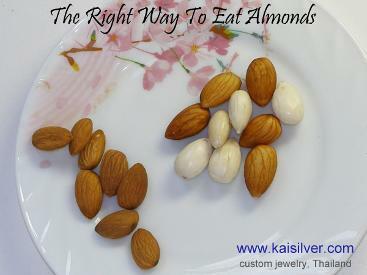 Soak the almonds for around 30-40 minutes in fairly warm water, taking off the skin then becomes much easier. We will talk about the nutritional benefits of almonds in our next newsletter.